Looking Forward! | Faddegon's Nursery, Inc. There are so many noteworthy plants coming on the market in 2016! We’ll begin profiling new introductions that our staff is excited about for the upcoming year. Hot! Hot! Hot! Wondering what to do with that hot, dry spot out front? Do you love hot color? Looking for flowers that love hot full day sun? 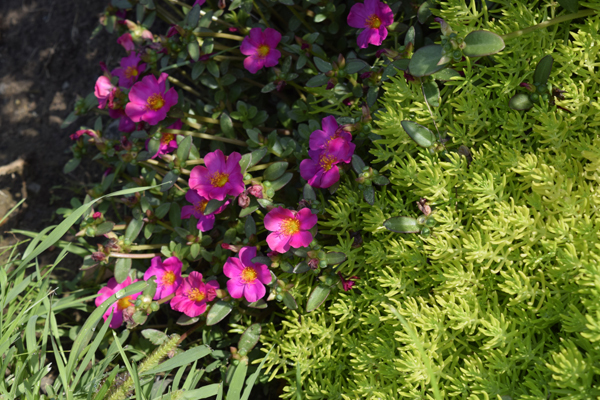 Mojave Fuchsia portulaca is the annual for you! We trialed it here at the garden center last year and were not disappointed. We loved the color and vigor! It’s very durable and blooms all summer. You’ll see it really take off when the days are long and hot. Plant Mojave Fuchsia along with low growing sedums for a great ground cover. Great as a spiller in containers too! Because of their size and color range, weigelas have the ability to pull the garden together, bridging the gap between larger shrubs and low-growing flowers. New introduction, ‘Tuxedo’ brings even more to the table by adding dramatic contrast to your existing landscape plan. Dark burgundy-black foliage arrives in spring, while summer has ‘Tuxedo’ showing off its true elegance with pristine white trumpet-shaped blooms. Suitable for any black tie event! Plant it on its own along a path or create the perfect backdrop for coreopsis, gaillardia or annual flowers. Butterflies will find ‘Tuxedo’ very attractive! We love Mrs. Hughes, but she may not appreciate Lady Rose quite as much as she deserves! Perhaps, she would be much more complimentary when considering the Hybrid Tea named after this ‘Pretty Lady’. This is the second in the Downton Abbey® series from Week’s Roses, joining last year’s ‘Anna’s Promise’. Like her namesake ‘Pretty Lady Rose’ is vibrant and showy! Though this rose is compact in habit, its deep pink ruffled blooms won’t hide in your garden. The petal count is high and Pretty Lady’s coloration is very long lasting on large (5′ diameter) old-fashioned English style flowers. Plant ‘Pretty Lady Rose’ near a seating area so you can take in her sweet scent. A strong peony-like fragrance with spice aptly describes Lady Rose herself!